It’s Game Day here in New England! The Patriots are playing Thursday Night Football and for some reason it throws me off when they play on Thursdays. I don’t know why that is. Maybe it’s because I’m so used to them playing on Sundays? Maybe it’s because when I wake up tomorrow I’ll think it’s Monday, but then I’ll be happily surprised when I realize it’s Friday? 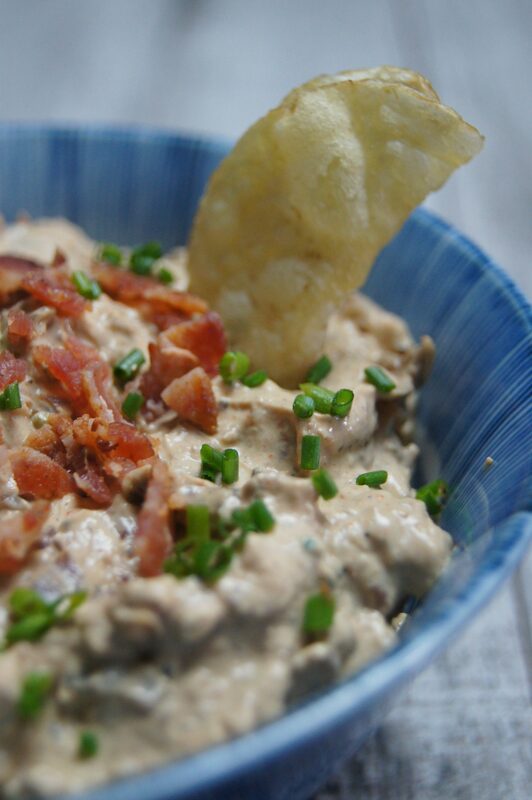 Whatever the reason, I’ll be “comforted” knowing that I’ll have this Bacon & Caramelized Onion Dip to look forward to. I may have mentioned before that I’m obsessed with chips and dip. So obsessed that I had it for breakfast the morning after a party. I don’t have it very often, but when I do I’m like a contestant on “Survivor” that hasn’t eaten anything but coconuts for 37 days and on day 38 finally wins a reward challenge that involves a bucket of chicken. In other words, look away; it’s not a pretty sight. So if I’m going to have chips and dip it’s going to be done right. One of my go-to dips is Lipton Onion Dip. I know, fancy. But the heart wants what the heart wants. And, in my opinion, the only chip that goes well with Lipton Onion Dip are Cape Cod Chips. Seriously, they are a perfect couple. I can’t remember the last time I made Lipton Onion Dip. Probably, the last time the Patriots played? But whenever it was, I remember pouring the dehydrated onions and seasonings over my sour cream and thinking, “This can’t be good.” The sour cream was organic so all wasn’t lost, right? Over the past few years, my family and I have tried to eliminate processed foods from our diets. We’re still trying, but we’re still better off than we were about four years ago. So now that football season is back, I’m trying to look for healthier options for game day eats. Eats that still taste good, if not better. 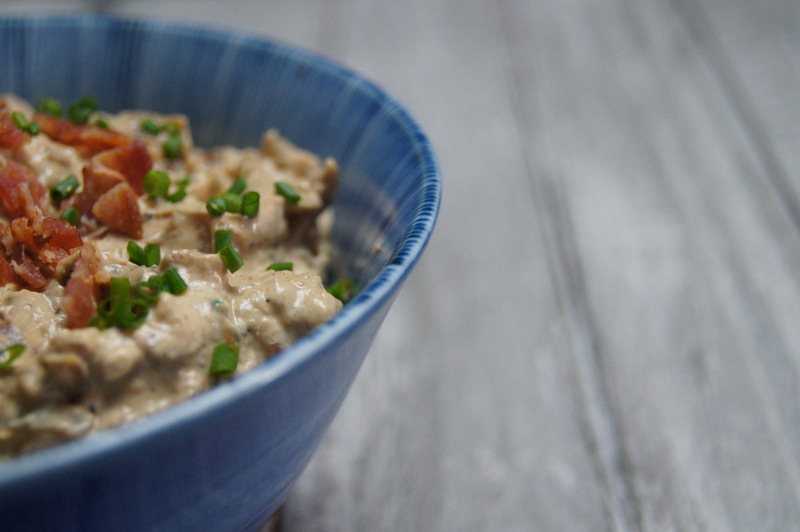 This Bacon & Caramelized Onion Dip definitely fills that category. Caramelized onions period are amazing. So having them in this dip just give it so much of a deeper flavor. 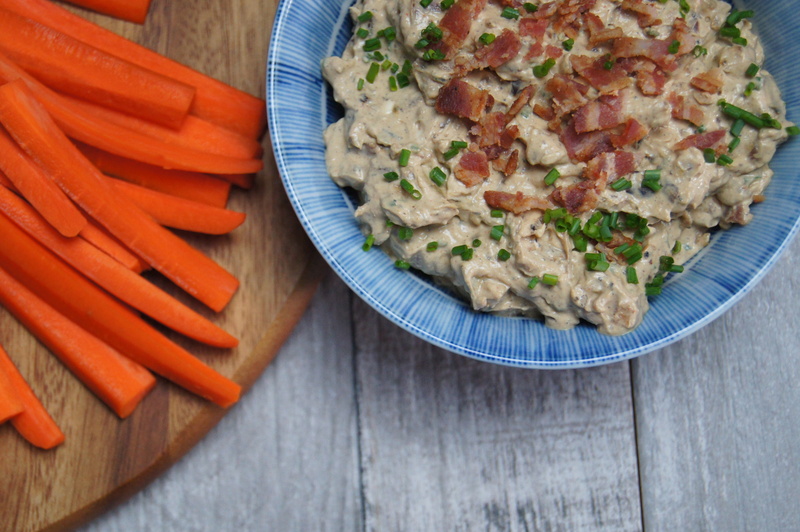 I have no words for how much the bacon in this dip elevated the flavors. Without the bacon, the dip was good. But who wants good when you can have great? And that’s exactly what the addition of the bacon has done here. Don’t get me wrong, I’m not proclaiming that this dip is health food. But I feel better knowing that it’s homemade and not entirely processed. 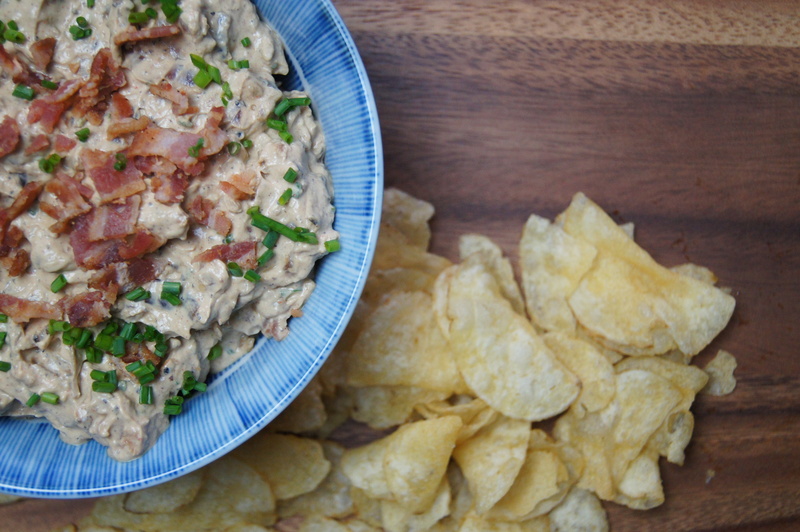 I’ll still have the Lipton Onion Dip, because honestly, it’s so good, and there will be days when I’ll feel too lazy to put the Bacon & Caramelized Onion Dip together. But it’s nice to know that there are other options. And this is definitely an amazing option. With Cape Cod Chips, of course. Cook the bacon in a large skillet over medium heat until crispy. Take the pan off the heat, spoon cooked bacon on to a paper-towel lined plate, reserve 2 tablespoons of bacon fat, then discard remaining fat. Finely chop cooked bacon, and set aside. Add reserved bacon fat back to the skillet with butter. Warm the skillet over medium-high heat until the butter starts to foam, then add the rings of red onion. Season one side with kosher salt and black pepper. Let the onions cook and caramelize for 5 minutes, then carefully flip each ring. Season the second side with kosher salt and black pepper. Continue to cook until the onions get dark around the edges (4 – 5 minutes more). Add the honey and garlic, and let cook until the garlic gets fragrant (about 1 minute). Add the white wine, and simmer until the liquid reduces and thickens (about 3 minutes). Take the pan off the heat and let cool to room temperature. Add sour cream and cream cheese to a medium bowl, and, using a spatula, mix until smooth and combined. Finely chop the cooled onions, then add them to the bowl along with any juices remaining in the pan or on the cutting board. Add smoked paprika, cayenne pepper, 3/4 of the chopped bacon, chopped chives, a pinch of kosher salt, and a squeeze of fresh lemon juice, stirring to combine. Season to taste with additional kosher salt, black pepper, and lemon juice. To serve, transfer dip to a clean bowl, and garnish with remaining chopped bacon, chives and a sprinkling of smoked paprika. 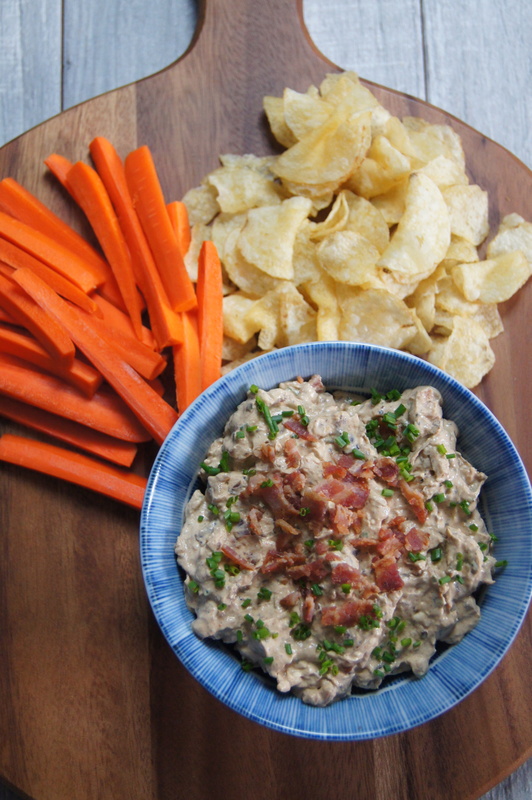 Place dip on a large platter, and surround with Cape Cod potato chips and carrot sticks. Enjoy!